As publication day approaches, I feel a little anxious. No matter how well the study has gone and how strong the products are, I never know quite what to expect of publication day. Because I sometimes used to skip from one study to the next without setting aside time for sharing and publication, I now write “publication day” into my planner and vow to plan an activity that will get the kids sharing their processes and products. I attribute my anxiety to the students’ anxiety–I know many of them do not want to share, even if they understand the importance of it. Also, publication can feel like a huge task to undertake at the end of a unit of study. But over the years I have come to realize three things. First, every student can share — if only a sentence — and feel good about the experience. Second, publication doesn’t have to be a huge operation. It can be as simple as reading a few favorite lines out loud to the class. And third, sharing is really important. It’s what keeps your workshop from feeling like school. It’s what keeps your writers from feeling like students. Below I’ve outlined seven sharing and publication opportunities for all writers–the shy, the fearless, and everyone in between. Favorite Line: Have students choose a favorite line from their piece. Invite all students to form a circle in the middle of the room. Encourage respectful silence. 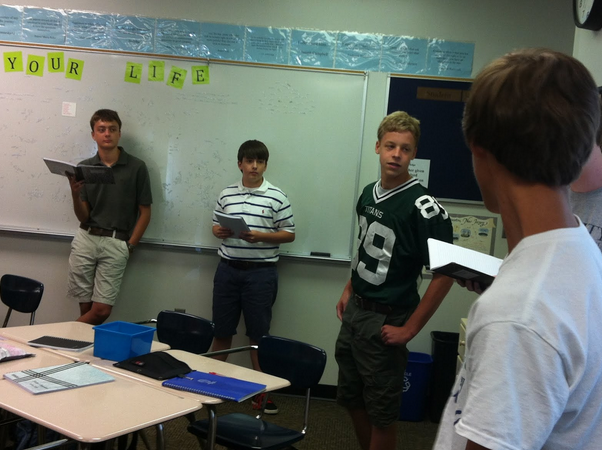 Students will read their lines, one at a time, without pausing in between. Many students appreciate the chance to share a line without feedback. Additionally, the string of favorite lines creates a interesting piece of literature unto itself and provides a nice sampling of topics, genres, and voices. Read Around: Have students bring in one page of their finished piece. This page can showcase several excerpts of the longer piece or a long section of the finished piece. Give students a pad of sticky notes, and invite them to travel around the room, stopping to sit and read each page, leaving sticky note comments (connections, praise, questions) for their peers. Skype Session: An author’s celebration Skype session with another class across the county, state, country — or world — poses a rewarding experience with minimal effort. All you need to do is find a willing educator-partner and place the call. One year, a group of my creative writing students read their work to a group of fifth graders and vice versa. It was the culmination of a 3-session project in which my students helped fifth graders revise and edit their writing. 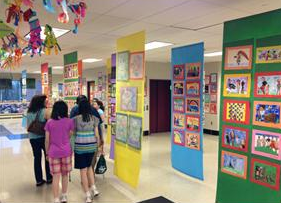 Art Show Panels: Art teachers have always understand the importance of displaying student work. I am fortunate to work at a school with art teachers who are extremely generous with their supplies. 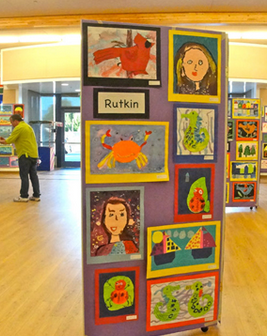 Consider asking the art teachers at your school if they have any art show panels you can borrow for a week to display student writing. Put the panels in high-traffic areas — the cafeteria or a common gathering space — to maximize sharing power. Audio Recording or Podcast: After I teach poetry writing, I ask students to choose their best poem and making a voice recording of it. As part of the study, we listen to writers reading their work and share what we notice: how writers put feeling into a reading, how they read poetry not line by line but in meaningful units. Then students post these recordings on their blogs for students, parents, and other teachers to listen to at their convenience. Websites like Audacity and Vocaroo are student (and teacher!) friendly and require minimal set-up. Digital Media: When studies grow out of real world digital writing, there is bound to be an online platform for publication. For example, when my eighth graders write letters to the editor later this year, they will send their letters into whichever news site they are responding to — www.nytimes.com or richmond.com (Richmond Times-Dispatch). Students who have written critical book reviews can publish their work in the Barnes and Noble or Amazon customer reviews section. Students with a Goodreads account can publish their reviews underneath their rating. Self-Publishing: Websites like Lulu and Papyrus allow students to self-publish online by creating e-books and then distributing them. With Lulu, students can sell hard cover copies or digital versions for Nook, Kindle, and iBook. Both sites offer resources such as cover design, interior book design, and copyright registration. Self-publication is a sure-fire way to motivate even the most reluctant reader to forge ahead towards publication. Who wouldn’t want to hold in their hands the fruit of their labor — something that will last forever? These seven opportunities run the gamut from low-tech to high-tech and scary to manageable (for even the shiest of students). Why not let your writers choose the occasion or media that feels most comfortable to them or best suits their piece? What other publication opportunities do you provide your students? Please leave us a comment or tweet @allisonmarchett @rebekahodell1. We’d love to hear from you! Previous PostTranslating Writing With Mentors for Elementary and Middle School, Part II Next PostWriting With Mentors — 30% Off On Heinemann.com!